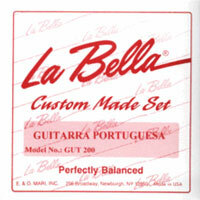 Often used in Fado music, these single loop end Portuguese Guitar Strings by La Bella are strung as 6 courses. An extra .012 is supplied as an optional plain 6th course octave in replacement of the wound .018. 40"+ length. Great quality, quick delivery, will buy from, Strings by Mail again! Q: Hello. i am interested in Portuguese guitar strings. are they all 'loop-end' ones? thanks in advance. Q: How long would it take to send a set of strings to South Africa?